So for those of you that didn’t see it, last Sunday saw Felix Baumgartner’s most recent project Red Bull Stratos being executed. In a nut shell, Felix jumped to Earth from a helium balloon in the stratosphere and set the altitude record for a manned balloon flight, parachute jump from the highest altitude, AND greatest free fall velocity. All pretty good I am sure you will agree. And being sponsored by Red Bull, an obvious choice for this project, they of course proceeded to use the various social media platforms at their disposal once he was back on the ground and this is when (luckily for Felix) it went wrong! The post was promptly deleted, and from the looks of it there isn’t too much fall out (get it!). In a effort to increase customers and Facebook fans TGIF introduced Woody, a fictional character who said that when his fan page reached 500,000 likes each fan would get a coupon for a free burger. After some TV and digital banner adverts TGIF hit their target in just 11 days something they didn’t quite expect to happen so fast and something they were not prepared for. When coupons didn’t come through fans took to the site to rant and all TGIF did was up the target to 1 million. Eventually the campaign was pulled and the fan page abandoned with all those captive fans and effort put into the campaign a waste of time. In the end they did nothing more than bribe fans to like their page and had no long term objective in keeping engagement. Oops! What happens when employees switch between their organisations twitter accounts and their personal ones? Yep, that’s what happened to American Red Cross last year with a swift apology sent after. But as it turned out this wasn’t all bad. 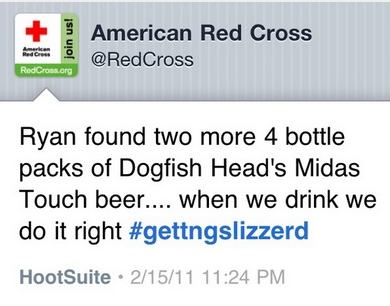 Seeing the funny side of it DogFish beer (an American beer brand) took the blunder and turned it into fundraising for Red Cross and bars started offering to buy Dogfish pints for people who could show they’d donated blood. In July 2012 O2’s service suffered a complete loss of 2G and 3G network services, crashing mobile, landline and broadband connectivity and in response angry customers took to twitter to complain, threaten contract terminations, or even just plain swear at the mobile company. 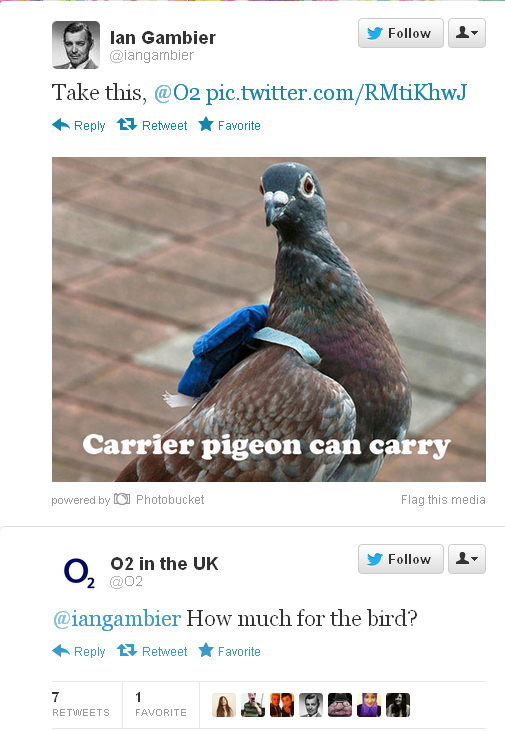 Rather than the generic responses, o2 took everyone by surprise and replied with humour and above all human responses, something every organisation must remember when using social media as a marketing tool. Do you know of any other social media blunders that went wrong (or right)? This entry was posted in Social Media and tagged American Red Cross, blunders, Dogfish beer, Facebook, Felix Baumgartner's, friday, O2, Red Bull, Red Bull Stratos, social media, Stratos, TGI Friday, twitter, world record. Bookmark the permalink. Free drinks? All right then! Sign up here to follow my blog!